I am a qualified Primary and EAl teacher. I started my professional teaching career as an EAL teacher ; the highlight of which was working at the prestigious Bangkok Patana school in Thailand working with the Early Years to Year 2 children. I was so inspired by my experiences there, I returned to England to train as a Primary teacher. Since then I have worked in a number of schools and countries around the world including the UK, Russia, Romania, Latvia, Thailand, Vietnam and China . I have taught across all the Primary Key Stages - Early years, Key Stage 1 and Key Stage 2 . This is my third time working in China as I have previously worked for Nord Anglia Education in Ningbo and Shanghai. I have led the subjects of Literacy and Humanities and was a consultant for a brand new school in Vietnam . 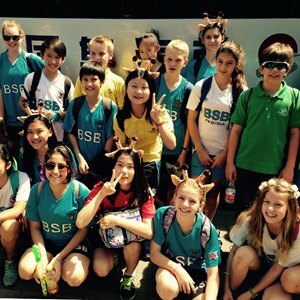 As I had previously worked in China and for Nord Anglia Education, it was a very easy decision to come to BSB Shunyi. I have always felt that Nord Anglia Education is a very professional company and it offers students and staff great opportunties to grow personally and professionally. In particular, I was drawn to the community feel of the school here in Shunyi , loved the initiatives and level of challenge the children receive and felt that the this school delivers an excellent all round educational experience for the children. I am passionate about my job chiefly because the children that I work with inspire and impress me every single day. I love seeing them grow and develop into their own personalities and witnessing the pride they feel when they learn something new . These everyday moments are so special. I believe that children should be guided in the classroom to make their own sense of the world, become independent learners and that learning should be individual and personalised . I myself grew up overseas and went to school in Bahrain so I understand the challenges children face internationally . I am married to Mr Burt who is the Head of Early Years this year and I have 3 beautiful step children. Family is very important to me and I believe that I share that philosophy with many cultures, especially here in China. I am always excited to move to a new country or area and to learn about the culture . My guilty pleasure is shopping but I am most interested in collecting art and ornaments that reflect traditional workmanship or the culture of the country I am living in.